PastureMasta - Fertiliser and Soil Conditioner by Seasol. 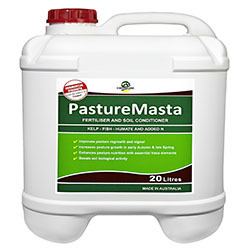 PastureMasta is a highly refined liquid seaweed pasture conditioner, blended with fish concentrate, humate and added nitrogen. Optimise benefits from both foliar uptake and stimulation of soil biology.